Here's what you will find in the Hackercool February 2017 Issue . 1.Real Time Hacking Scenario - Hacking my friends : Hacking my friiends systems by bypassing antivirus. Installit :See how to install OpenVAS vulnerability scanner in Kali Linux. The Art of Phishing :This month we will learn about the most successful hacking attack, phishing. 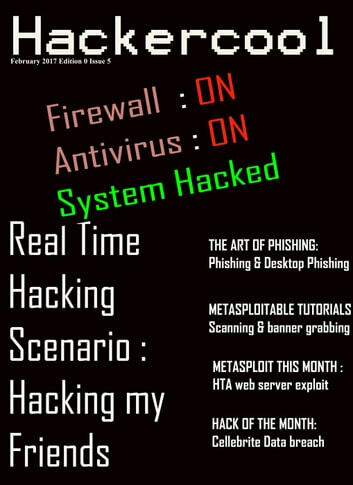 Metasploit This Month :In this section we will see how to hack Windows systems with HTA web server. Metasploitable Tutorials :Let us see scanning and banner grabbing. Hacking Q & A :Answers to some of the question's on hacking asked by our readers. Hack Of The Month :The company in the news for breaking the lock of an Apple phone is hacked. Hackstory :Shamoon 2 is here.